In 2011, Bowel Cancer UK wanted their annual review to tell the charity’s story in engaging, exciting, impactful way – so funders and donors would feel compelled to give. That’s why they commissioned me to come up with concepts for and write all the copy for the publication. To write a striking 12-page annual review that got to the core of the charity’s impact and story – and wasn’t simply a list of achievements and stats. We wanted readers to come away thinking Bowel Cancer UK was a dynamic, interesting organisation – that’s worth giving money to. I came up with three innovative concepts for how to structure the annual review, then wrote all the copy for the option the charity chose. 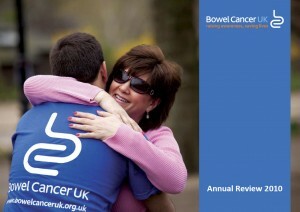 A short yet highly impactful annual review that Bowel Cancer UK are using as their main marketing document in 2011/12.